The food combining chart provided below is a quick reference guide that helps create healthy meals that provide good digestion. Some people enjoy going to the extremes when it comes to combining every morsel of food. That is great, but even limited food combining can give great results. There are two essential rules that need to be followed that will get you well on your way. Always eat fruit on an empty stomach or 20 minutes before consuming other foods. Fruits are one of the best foods to consume. They take the least amount of time and energy to digest and they give you back the most in return. They are truly one of the healthiest gifts from good old Mother Nature. Do not mix concentrated proteins with concentrated starches at the same time. 6 -14 hours) leaving food there to ferment which creates extra toxins in your system. Good digestion can be a speedy 3 – 4 hour process which leaves surplus digestive juices available for detoxifying the body, not adding toxins to it. 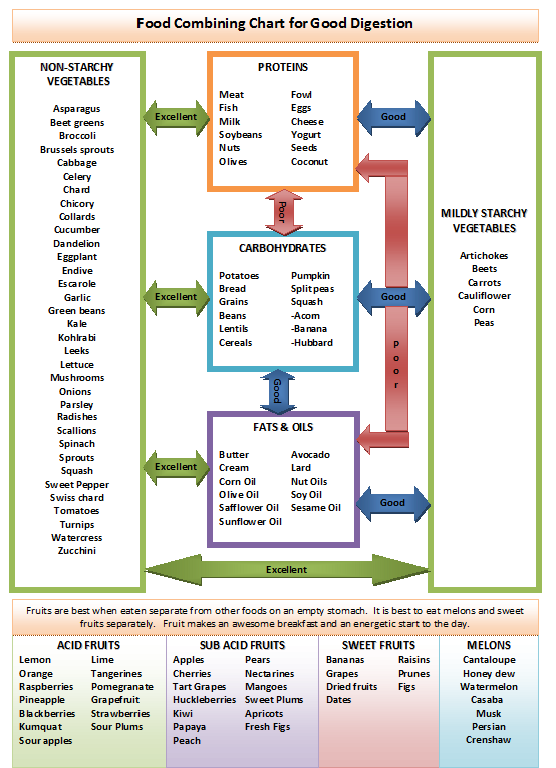 Here is a printable copy of The Food Combining Chart to place on your fridge or have handy for quick reference. This program or way of life could probably be described as one of the most successful diets of all time. It has helped millions of people to lose weight, relieve digestive issues, regain health, increase energy levels and keeps the digestive tract cleaner to help prevent illness and disease. It is the belief of many physicians, natural therapists and ayurvedic medicine that the root cause of all disease stems from impaired digestion. If you have never tried a lifestyle that incorporates combining foods properly, all I can say is give it a try. If you have tried before and given up, please give it another shot. This chart is a helpful tool but it doesn’t have to be taken to extreme, just remember the two main rules as mentioned above to start with. It doesn’t take long to see and feel the positive changes when digestion is improved.